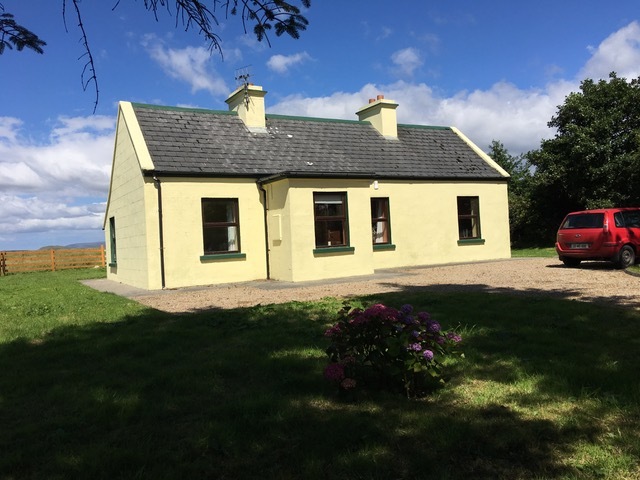 Claggan Cottage is a retreat on the west coast of Ireland. Claggan Cottage is a dépendance of Polranny Pirates. The cottage lies isolated in the only, true wilderness of Western Europe, in Ballycroy, county Mayo. It is a perfect retreat for the independent creative individual. But you can work here with up to two people. There is no public transport and private transport is therefore necessary. Do you want to know about prices? 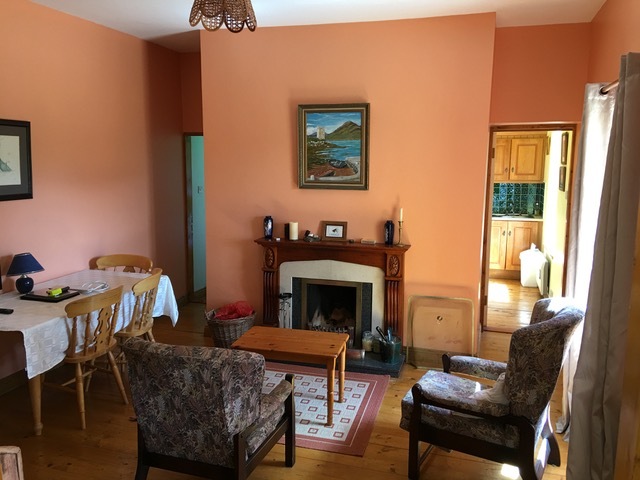 The accommodation is a traditional Irish cottage from 1938. 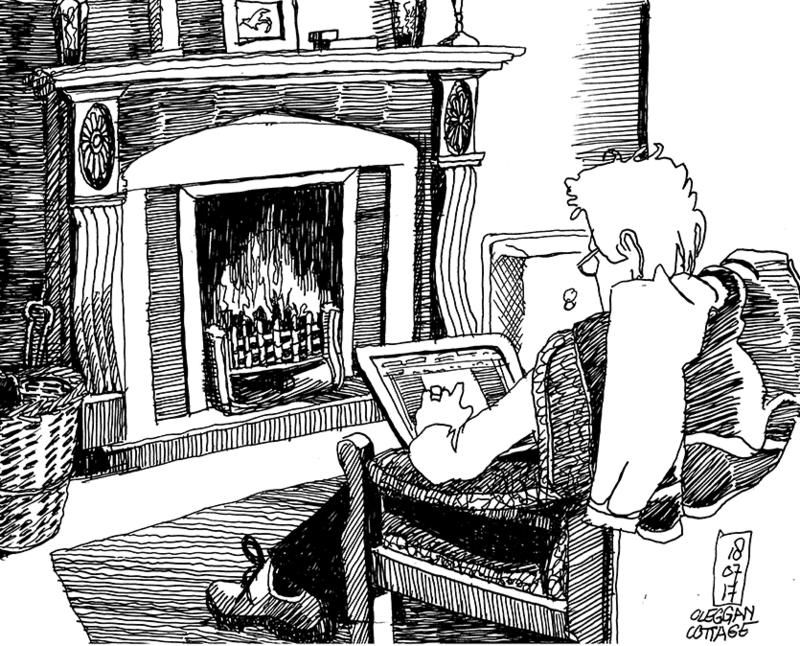 There is no Wifi, but occasionally you can use 4G and a smartphone to access the internet. Rear of the Claggan cottage. A modern bathroom with toilet was added to the cottage later, in an extension at the back. 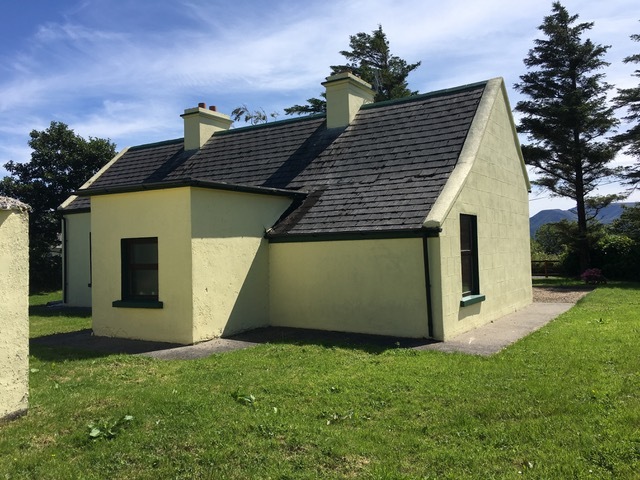 Claggan cottage consists of a ground floor, with a small entrance (the ‘porch’) a sitting room with fireplace, an office, a bedroom, a kitchen and bathroom with shower and toilet. the sitting room with fireplace, and straight ahead the door to the kitchen. We are quickly fully booked! 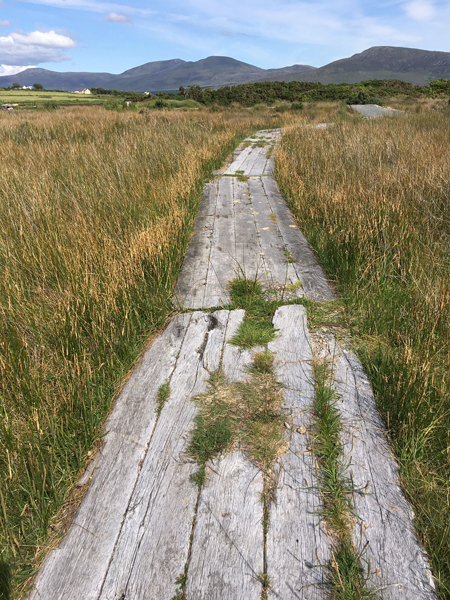 Claggan Cottage Artist Residency is surrounded by bays of the Atlantic Ocean. 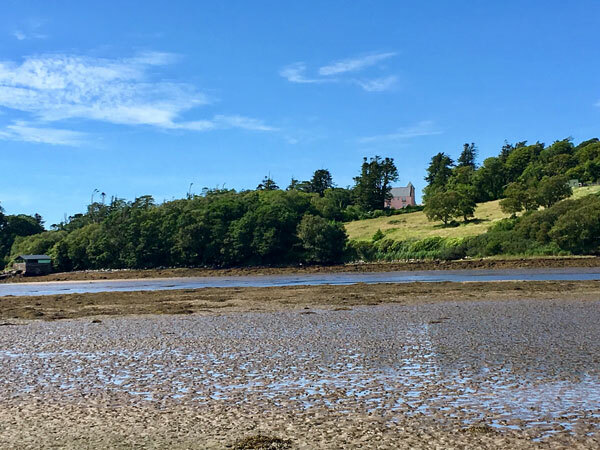 If you go down the road to the coast below, on the way to Bellacragher Boat Club, you will see Polranny Mountain in front of you on the other side of the bay, in clear weather. For Bellagraher Boat club, turn right on the wooden path. 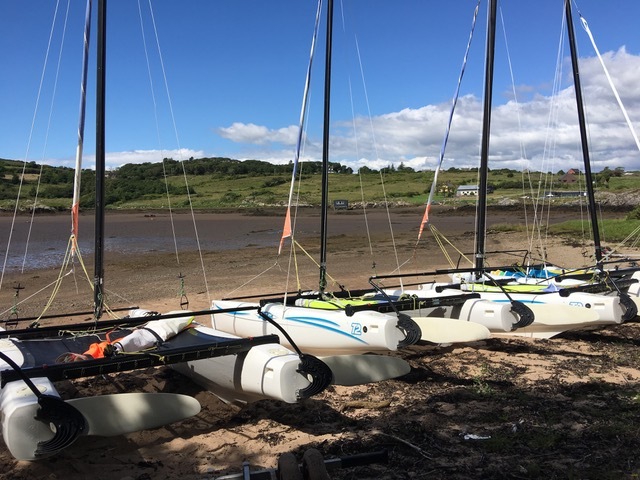 Six catamarans are moored in a sheltered bay by Bellagragher Bay. The owner of the catamarans lives nearby, on the asphalt road to the bay. You only have to encounter one person, and he or she can tell you where he lives and whether or not he is at home, and at what time. And maybe it happens to be the owner himself …. More information on the catamarans in the bay you will find in this video (change to Dutch websitepage, please. The video is in English). On the other side of the ‘bay’, there is a pink house, with the boathouse that belongs to it on the far left. This is the well-known Rock House from 1838 when the West of Ireland was popular as a hunting ground in England. The book Wild sports of the West (1832) takes place around the bay. If you want to get into the slow mood of Ballycroy, it is highly recommended. 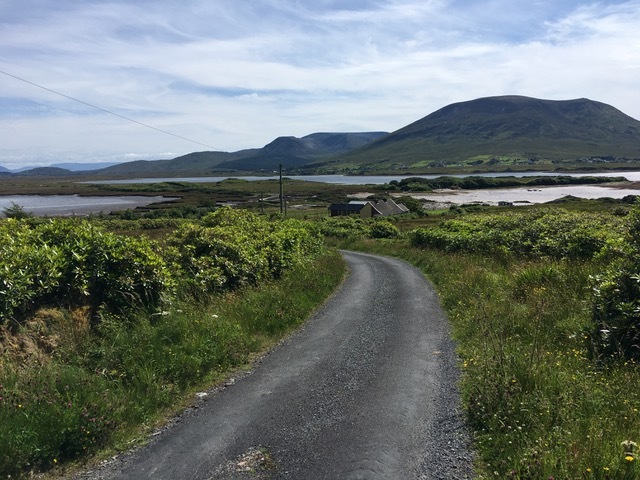 Ballycroy Ginger & Wild café is close to Claggan Cottage. The café is part of the Ballycroy Visitor’s Center, in Ballycroy Village. It is a modern white building, visible from the N59. You can eat and drink deliciously here, vegetarians too. Non-vegetarians should definitely try the tureen for lunch here! And there are regular exhibitions. A small information center has been set up in the soutterain over the Ballycroy National Park, the only true wilderness in Europe! There is also a Mayo Dark Sky Park, for when you are interested in stars. 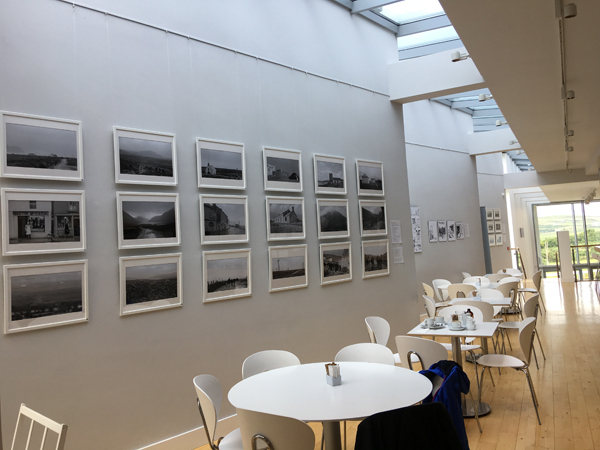 Ginger & Wild café is open from 10.00-17.30. There is free wifi. Polranny Pirates have more to offer, view our headquarters in Polranny, also an Artist Residency on the west coast of Ireland, at the foot of Polranny Mountain.